Today only, Amazon has the Fit & Fresh Kids’ Healthy Lunch Set, 14-Piece Value Reusable Container Set with Removable Ice Packs on sale for $11.19 as one of their daily deals. Shipping is free on orders of $25 or more on Amazon, or get free shipping with Amazon Prime (get your free trial). Amazon prices can change at any time. Back to School time is just around the corner for us here in Oregon. We’ve had a busy summer and I’ve found myself caught a little off guard with the amount of school shopping I still need to do in a short time. As if school supplies aren’t expensive enough for three kids, I’ve also got to try to get in some clothes/shoe shopping as well. Being on a budget, I try to find great deals. When I am short on time, I know that I can count on Goodwill for clothes for the whole family at affordable prices. I like to shop there because I get them name brand clothes at a great price and it helps the community at the same time. I am pretty picky and can find some really nice, gently used clothes and shoes that last them quite a while. Salem OR -mom Heather has been able to check off a lot of boxes on her kids’ back-to-school list. 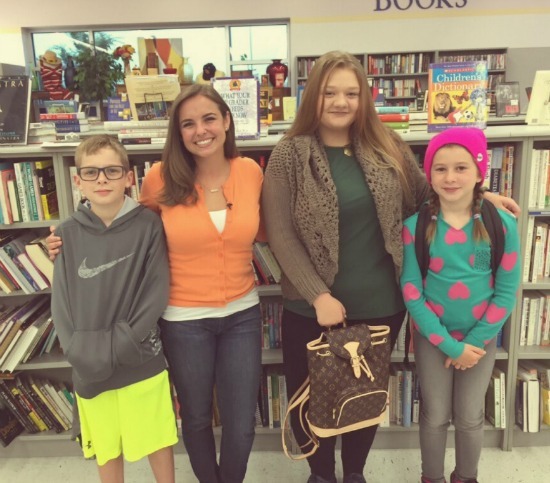 After winning a $250.00 JAM’N 107.5/ Goodwill shopping spree, Heather Usrey is well on her way to having fulfilled her kids’ get back-into-the-classroom- needs. (And she still has a gift card balance of more than $50.00)! Goodwill also has new and donated school supplies such as backpacks and books, dorm room finds and electronics. When shopping in any of the 50 Goodwill Industries of the Columbia Willamette stores – revenue directly goes to support local persons in need of free job services or job training in NW and Central OR and SW WA. Last year alone, more than 530,000 services were provided to people with barriers to employment. Persons, for example, who might have educational or language difficulties, physical disability, and broken work histories. Save money, get kids the stuff they want, be good to the planet and lend a hand to your neighbors in need. That’s a great start to a good school year! When you shop at Goodwill, you are helping support Goodwill’s mission of providing vocational opportunities to people with barriers to employment by giving them free career training and development, English classes and help getting citizenship, and also helping them find job opportunities and much more. You can find more information about Goodwill and their Job Connection page, on the Goodwill Facebook Page and on Twitter. Disclosure: I received free product as part of this post. All opinions stated are my own. Amazon has the Ticonderoga Wood-Cased Graphite Pencils, 2 HB Soft, Pre-Sharpened, Yellow, 30 Count for $5.99. Lands’ End is celebrating National Backpack Day today with 50% off backpacks and coordinating lunch boxes and free shipping when you use code BACKPACK50 at checkout. Thank A Teacher With Crayola & Win! Can you believe that it’s already time to start thinking about sending the kids back to school? What better way to go back to school than with a thankful attitude. Crayola is offering a fun way to do this with their Thank A Teacher promotion. Go here to Thank A Teacher. Disclosure: I received free products to facilitate this post. All opinions stated are my own. Amazon has the Elmer’s Disappearing Purple School Glue, Washable, 30 Pack, for $6.33 when you clip the $0.25 off coupon. Ships with your order of $25 or more. Amazon prices can change at any time. How is it time for Back to School already? I know some of your kids already went back but mine won’t start until after Labor Day. Can I just say that I feel like a major procrastinator, because I am totally not ready? Well, I am done with the supply shopping, but I haven’t bought the kids very many clothes or shoes yet. I am planning a big trip to Goodwill very soon to get all of our Back to School shopping finished. I like to shop there because I get them name brand clothes at a great price and it helps the community at the same time. I am pretty picky and can find some really nice, gently used clothes and shoes that last them quite a while. This Back-to-School season will cost parents hundreds of dollars. The Nation Retail Federation says this year the average family with school-aged children will spend about $674.00 on back to school clothing and supplies. That is 10% more than last year. College aged students expect to shell out nearly $900.00. 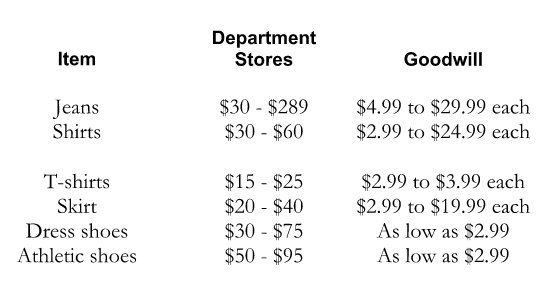 Take a quick look at Goodwill clothes prices for kids/youth compared to typical department store prices. This year parents can get an “A+” in shopping. Goodwill also has new and donated school supplies such as backpacks and books, dorm room finds and electronics. When shopping in any of the 51 Goodwill Industries of the Columbia Willamette stores – revenue directly goes to support local persons in need of free job services or job training in NW and Central OR and SW WA. Last year alone, more than 530,000 services were provided to people with barriers to employment. Persons, for example, who might have educational or language difficulties, physical disability, and broken work histories. Save money, get kids the stuff they want, be good to the planet and lend a hand to your neighbors in need. That’s a great start to a good school year! It seems like every year, back to school shopping sneaks up on me. I know some of your kids have already gone back, but mine won’t start until after Labor Day. I’m grateful for the extra couple of weeks because I truly need it to get all of the school shopping done for my three kids. After all, we’re not only talking about the seemingly never ending lists of supplies, but also clothes, shoes, haircuts, etc. I feel like we’ve been so busy this summer, and while I do love a good sale and all, sometimes I just like to save my time and energy by buying as much as possible at one time. One of my favorite places to get a chunk of the school supplies is Oriental Trading. They have a huge selection of school supplies and the best part is that I don’t have to leave the house. I love doing this because you’re basically buying in bulk, which means you have leftovers. For me, this means that I have less to buy the next year. Or, if you’re not the stockpiling kind, you can always donate the leftovers. Here is what I picked up this year. Elmer’s® School Disappearing Glue Sticks: Comes in a pack of 12. Pacon® Composition Book Wide Ruled: You can order just one of these, but we needed three so, I got three. Pencil Boxes: These are pretty sturdy and come in a pack of 12. Mood Rulers: These are just for fun and also come in a pack of 12. Fidget Busy Blocks: You get 6 of these in a pack. In my opinion they are better than fidget spinners and I have enough that we can use some for those birthday parties that come up over the school year. Crayola® Washable Pip-Squeaks® & Paper Set: This comes individually, as do most of the Crayola products. Still needing a few school supplies, or haven’t started shopping yet? Be sure to check out Oriental Trading. You’ll get free shipping on your order of $49 or more. Click here to shop. For more must have items for school, be sure to check out my Back to School Guide.